Covering a distance of more than 1200 kms (one way), this is probably my second longest road trip ever, after my university days in Canada (I remember one hot summer where we skipped summer classes, rented a compact car with 4 friends and travelled from Winnipeg to Vancouver passing thru western Canada cities such as Regina and Calgary. Wait wait … there was another trip from Winnipeg to the South (North Dakota, South Dakota) all the way to New Orleans, Lousiana, USA. Yes student days were so much fun and carefree, nothing to worry so long you got enough CGPA to offer to your sponsors). Back to Malaysia. I believe this is the only way to explore Sarawak’s many cities and towns and villages and their inhabitants along the way. Never mind the roads with potholes here and there, sceneries and places with strange names and sounds make you wonder about this big country. Yes it is a big country where dreams stay with you along the mountainside and riverside and roadside (remember some old song BIG COUNTRY?). Yes this country really big –running from northern tip to southern part of the Sarawak state. I managed to stop by interesting towns like Bintulu, Sibu, Sarikei, Saratok, Sri Aman and Serian. Except Sibu and Serian, most of Sarawak towns are off tangent from the main Miri-Kuching road a.k.a Pan Borneo Road. It means you need to take a turn and travel some distance more to get to towns like Mukah, Sarikei, Bentong and Sri Aman. I have covered all these town in this trip, save Mukah. (Insyaallah Mukah trip next time). This project took off in December 2011 during long school holidays. We convoyed in 2 cars, or more specifically one car and one MPV. Toyota Ipsum — fully loaded with kids and adults alike– was doing well until it reached Sibu. Kia Forte was proven on Sarawak roads except on the return trip where I went into large pothole at 100kmph, puncturing both tyres at left side almost immediately and simultaneously. Changing tyres at dusk during light rain, some 80 kms towards Bintulu, near Tatau on Sibu-Bintulu stretch, was some kind of experience. Multiple attempts to jack up the car failed as the ground was soft and wet. Finally we made through after Adam kept saying and pushing: “Try and try and try. I don’t want to stay overnight here in the middle of Borneo nowhere”. Alhamdulillah we managed to replace the bad tyre without help and nobody had to sleep in the car by the roadside that night. Instead we managed to get to Bintulu town in a limping car (yes with one handicapped tyre) and spent a nigh there. Leaving Miri at 3pm in rain, we passed by Bekenu to reach Bintulu, some 210 kms from Miri. We passed Tatau, Selangau and finally arrived in Sibu at 9pm. Driving non-stop took a toll earlier than expected. Fatigues. Eyes were heavy and views were dimmed. We put up a night at Paramount Hotel in Sibu, on the way to Kuching. Sibu is a beautiful city by the big river – Batang (Sungai) Rejang, where we enjoyed the view only the next day, as we arrived already late at night. River view of Sibu, from our hotel room. Rejang River started in Sibu before going upstream to Kapit town. Hotel Paramount in Sibu. We stayed here for a night en route to Kuching Sarawak. 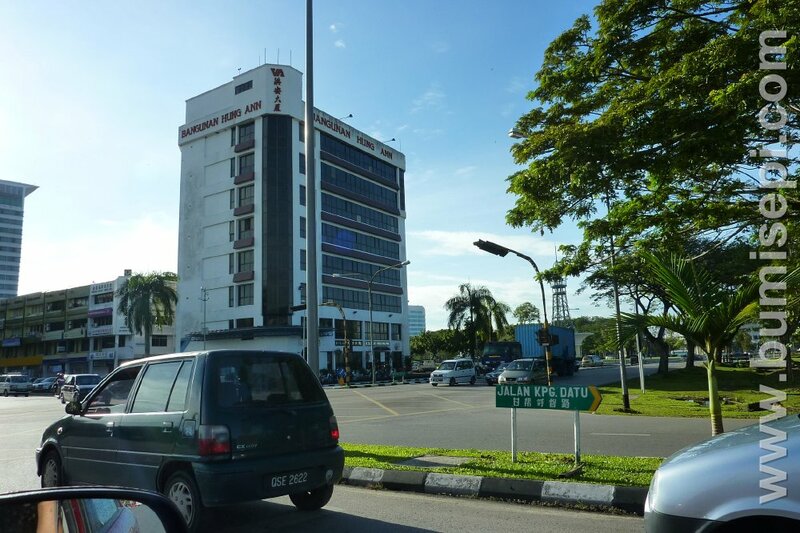 Sibu is the third largest city in Sarawak — after Kuching and Miri — is more known for a wrong reason. A city of underworld activities and gangsterism. Foochow people live here alongside Melanau and Iban. Sibu is also home for many timber tycoons with big “cables”. Crime rate here is probably one of the highest in Malaysia alongside with Miri and Bintulu. Despite what has been written about the city, my one night 2 days in Sibu was a peaceful one. We savored sup pelir sapi at Taman Selera Harmoni, near the river. The next morning, we continued the journey passing thru towns like Sarikei, Saratok, Betong, Sri Aman toward Kuching. Saratok is a small town, a bit detour from the main road Sibu – Kuching. It is a capital town of Betong Division, with a population of about 50K, mostly Iban people. Here are some photos I managed to snap on Saratok and nearby. We continued our journey toward Kuching passing villages and small towns in Sarawak. The life was so quiet and peaceful around here. One of the town we stopped by was Sri Aman. We came to see benak phenomenon at Sri Aman, but the timing was not right. We finally reached Kuching (Damai Puri Resort in Santubong area) at about maghrib time in heavy rain. December and early January was the monsoon season in this part of the world. Rains and winds greeted us on our arrival. Santubong is originally a small fishing village but one side of it (the mounstain side) is dotted with many beach resorts, popular with tourists seeking sand and sun. Santubong is about 40 minutes drive north of Kuching. Only one night there at Santubong. The next day we explored the villages nearby Santubong like Kg Buntal after checking out from Damai Puri Resort. Leaving Santubong and its princess (tak sempat cari Puteri Santubong) our next destination was Kuching City, the largest and capital city in Sarawak. We checked in at one downtown hotel. The following day, after exploring Kuching city, traveled to Bau town with main intention going to Serikin, near Kalimantan border, famous with barang dari seberang. Unfortunately just after leaving Bau we had to make U-turn. The road was closed to small and light vehicles due to flood. It was raining throughout this trip, the especially on the return trip to Miri. So tak sampai Serikin eventually. Wan Nor was not happy and said she SHALL come back to this city. (Puncak Borneo was not in the agenda, maybe in the subsequent trip). However I managed to capture some photos on Bau town and Kota Sentosa town. When Serikin trip was canceled, Plan B was quickly developed. We planned to visit a friend of mine in Kota Samarahan, whom I knew from Yangon days when he was working with Malaysian Embassy there. Kota Samarahan is home to the Universiti Malaysia Sarawak (UNIMAS). From town of Bau, we got back to Kota Sentosa and off to Kota Samarahan. We managed to find ways to get to his house in Kota Samarahan. Meriah sangat bila jumpa kawan lama! Borak sampai tak ingat hari dah senja. That evening, all things done, we drove back to our hotel in Kuching city center. The next morning, we started the trip back to Miri via the same road we came in. On the return trip we passed by Serian town and a stopover at Bintulu. There was a heavy rain in Serian and some stretches were flooded. Serian is a capital town of Serian Division in Sarawak with its population of about 100K. It is only about 60 km from Kuching located on main road from Sibu/Sri Aman to Kuching. A church with unique design along Pan Borneo highway. Semoga Allah beri hidayah kpd mereka. A road accident on Pan Borneo highway. Croc infested lake in Serian Sarawak. That is the summary of this 5D-4N trip from Miri – Kuching and return. Enjoy the photos.